The end has come for the current storyline and the ongoing adventures of the Scooby Gang. But at least we leave them on a high note, with some hope for where they might go next. For their last battle, they certainly give it everything they have, and I can say I was mostly satisfied with the outcome. 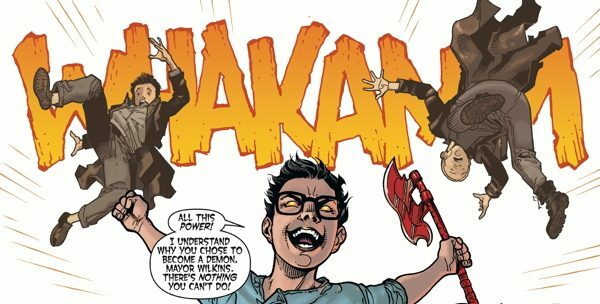 When last we left them, Buffy’s plan to power up and take the demons into Hell didn’t go as expected. Instead, Harth gained the power for his own, and next we see him actually take the Scythe from Buffy as well. He is taking on the Slayer powers, something that should be impossible. And while Fray thought it had to do with being her twin, it had little to do with his female connection. Other men had done the same in the past, though they could never endure the powers for long and instead soon went insane from the overwhelming nature of the Slayer connection. This is something that Harth seems immune to, tied to the fact he is a vampire now and can therefore handle the pressure. Whatever the reason, he served as a worthy opponent in the ultimate battle, and one that seemed impossible to kill. But impossible is something that the gang does not deal well with. Giles’s suggestion of escape and regrouping is instead met with refusal. Angel, Spike, and Illyria want to end this fight once and for all, sticking with the plan even if it means they have to follow the monsters into Hell. Well, it was worth a try, but even though Dawn could open a portal, Willow couldn’t manage to conjure up a strong enough whirlwind to force the demons in. An alternative solution had to be found. So, if magic wouldn’t do it, manual labor would have to serve the purpose. 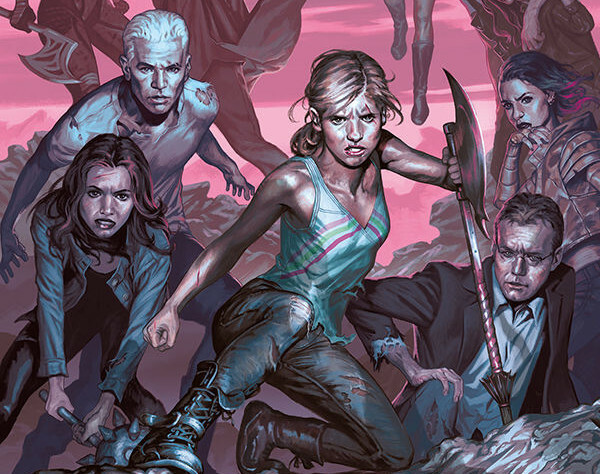 Buffy and the others decide to take them in bodily themselves, but Illyria doesn’t want them to make that ultimate sacrifice. With a kiss for Angel, she resumes her old form and takes the demons all through the portal on her own, with a goodbye to her friends before the portal closes. With the demons out of the way, the fight continued with the other monsters, but Harth didn’t want to share his power, so he starts taking out his allies as well. Never trust a madman, since he will stab you in the back. But, also, never trust that the power of Slayers can be contained. 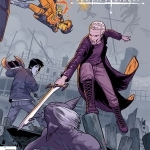 Just as Harth is about to bite Buffy, the memories of the Slayers bombard him and he falls. It was the chance the group needed to gain the upperhand. Fray holds onto him as Buffy stabs him through the chest with the Scythe. And with his dying breath, he gives the future Slayer memories to Fray. Strangely, though, she doesn’t have any memories past that point. What might that mean for their future? No one’s sure at that moment, but it becomes a bit clearer days later when they open a time portal for Fray to return to her era. It is not the same world as she left it, but instead one with less destruction and less connection for her. In fact, she and her sister don’t exist in the timeline, though the Watcher’s Writings did talk about them and their sacrifice. 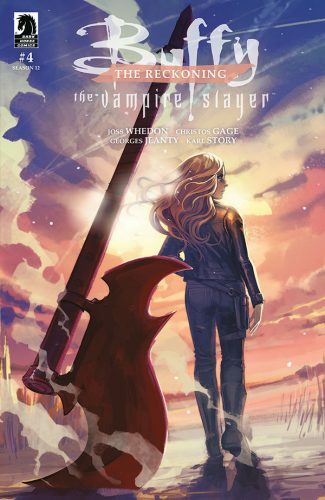 With their past written, and their place in history known, they are welcome by a group of Slayers, who tell them they have a family there and a future of their own to develop. So, it looks like they are set at least. Back in our time, two weeks later, we see Buffy and Faith at the San Francisco Police Academy, where they’re training to be officers. With Xander picking them up after their training day was done, the three of them join the rest of their friends and family for a barbecue to celebrate where they are now and what they have achieved. All is well and happy, with everyone together. Well, most everyone. Spike’s hanging out inside, acting a bit down, and Angel’s feeling out of sorts as well over the loss of Illyria. And we learn that Angel will be sticking around a while, until they can figure out how to retrieve Illyria, which means Buffy and her two loves will remain together for the time being. Although I liked that we ended on a happy note, I still wish the commitment between Spike and Buffy would have been more explicit. Forever a Spuffy fan, I remain committed to a future that has them together forever. And since the story has stopped for now, I can envision that’s how it will all play out.